In 1995, there was no awareness of breast cancer in Bosnia. In fact, the way people perceived this disease was similar to the reality we faced in the United States when our organization was founded in 1982 - a shroud of shame, stigma and misinformation. When women and men don't have access to high-quality cancer care, families are struggling to pay the bills because of outrageous medical expenses and biomedical research funding is at risk of being cut, we can't afford to be silent. We can make a much greater impact if we raise our voices to help others. It's an honor to celebrate these women and countless others this month - the 28th annual Women's History month - who uncompromisingly pursued their passions and dreams, often in the face of criticism, stereotypes and stigma. No matter the country or region, we have consistently learned through our work that conquering cancer is not only about research and therapies. It requires creative and innovative solutions to ensure that women and men everywhere have access to the advances that could save their lives. President Obama's announcement of a cancer "Moonshot" - with Vice President Joe Biden at the controls - is sending positive shockwaves through the cancer community today. It is the right initiative, at the right time, with the right leader. Through the chaos, one thing was undeniable: good people are everywhere you look. In the midst of devastation there were flowers, offering hope for a better tomorrow. Nancy Brinker's determination to fulfill her promise to her dying sister to do something about breast cancer has changed the world. The passion, determination and persistence of women like Brinker have spawned new organizations, fought diseases, and led to the world being a better place for all. We are gaining on this disease, and that's the good news for those who are impatient, like all of us who work every day to find the cures and help the people who need us. Last month, when President Obama visited Kenya to participate in the Global Entrepreneurship Summit, he regrettably did not have the opportunity to visit the important region of southern Kenya to see firsthand how economic growth is fueled by partnerships. 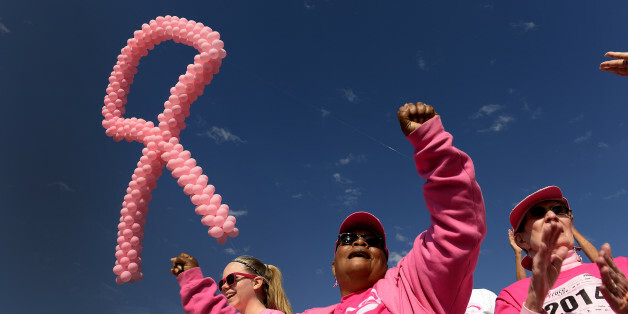 Republican leaders pulled a commemorative coin bill from the House Floor on Tuesday because it would funnel money to the breast cancer charity Susan G. Komen, which gives grants to Planned Parenthood. Perhaps some of the most innovative work in the field being done today centers around genomics and related fields such as proteomics. They have given researchers new ways to understand susceptibility to cancer -- especially breast cancer -- and therefore new targets for treatment. We are standing at an extraordinary moment. For nearly 4,000 years of recorded history, cancer in all its forms was an implacable foe. Doctors, patients, and researchers won incremental victories, but for millennia, the word "cancer" was too dreadful to speak aloud. One of the most remarkable qualities of the breast cancer community is its willingness to help others who are facing the disease today or might in the future. The real question is, why should women's access to health services be dependent on whatever ideologies currently prevail among legislators? Every 19 seconds, somewhere in the world, a person has a new diagnosis of breast cancer. In the U.S., a woman is diagnosed every two minutes, and one dies every 13 minutes from this terrible disease. Those are shocking numbers, and behind every one of those numbers is a compelling story. I am concerned that, when it comes to sharing what we know with our daughters, we face a challenge we did not anticipate. Breast cancer isn't being ignored. You know what's being ignored and the real elephant in the pink room (see below for more on this reference): metastatic breast cancer, aka Stage 4 breast cancer. Maria Shriver's report this past week on the economic crisis plaguing American women reinforces what those of us who work with vulnerable women see every day.